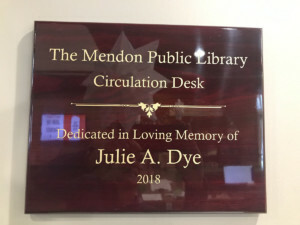 The Mendon Public Library Board of Trustees met with and thanked the members of Julie A. Dye’s family for the honor of naming the circulation desk in her name this past December. Julie A. Dye was a proud Honeoye Falls resident, active community member, frequent library patron, passionate reader and devoted grandmother. Her family, including her daughters: Cheryl Krall; Cindy Cannon; Sandy Smith; and Laurie Miller, decided a gift to support the Mendon Public Library in their mother’s name, would be a fitting tribute to such a special woman. 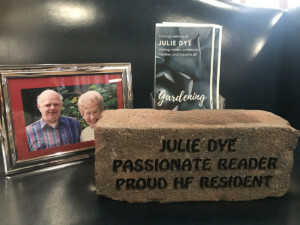 A plague signifying the circulation desk named in honor of Julie A. Dye has been installed in the library along with a brick honoring Mrs. Dye in the brick garden, and a book list that offers patrons a variety of gardening books for folks of all ages who want to make the world a brighter place.